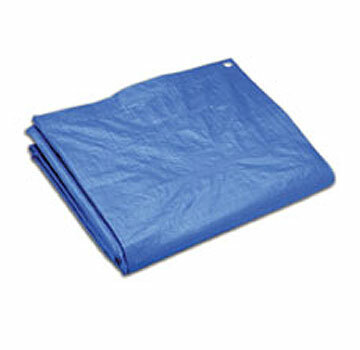 PRODUCT: 8' X 10' BLUE POLY TARPS, 8X8 WEAVE. ECONOMY GRADE 2.3 OZ. 20 TARP(S)/CASE. PRICE/CASE. 8 X 8 WEAVE HDPE WOVEN CENTER. 30 MICRON THICK LDPE LAMINATION BOTH SIDES. ALUMINUM GROMMETS EVERY 3' AND IN ALL CORNERS. APPLICATIONS: Economical temporary and light duty covers. Not long-term sun exposure resistant.